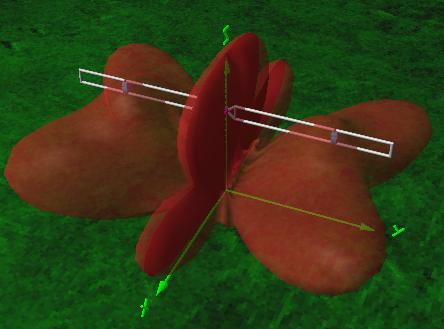 This article describes the design and simulation of a two wire broadband dipole antenna for the HF band, using the software 4Nec2. The antenna is designed to operate in the full range 3-30 MHz. 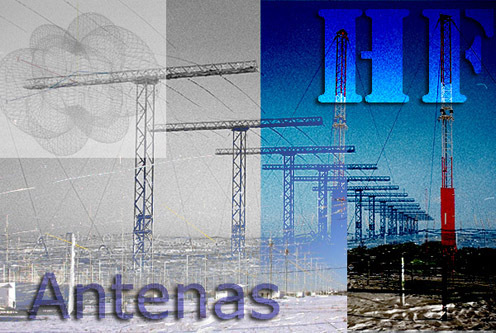 Acknowledgement to EA4NA for his support in the antenna analysis. The simulations are focused to obtain the impedance and the radiation patterns of the antenna in this band. Remarks: Resistive and inductive loads. Fig.1. Two wire broadband 3-30 MHz dipole antenna. Both wires must reach a separation of 1.80 meters at 1.25 meters from the feeding point. At this point, a metallic spacer is placed in order to keep the wires parallel. After the first spacer, both wires spread along 12.10 meters to reach another metallic spacer. At this point, there is a discontinuity of 0.45 meters with the next leg section. The next leg section is made of two wires again, with one metallic spacer at the beginning and other at the end. This section has a length of 6.40 meters. Both sections are joined by one carbon resistive load (330 ohms, 2 W) and one inductive load (16 uH), placed in parallel. AMSAT Argentina provides some helpful tools for the design of inductances. All the wires are made of copper with a diameter of 1 mm. The eight spacers of the antenna are metallic with a diameter of 12.5 mm. The maximum power applied to the antenna must not exceed 350 W.
The fig.2 shows the antenna modeled with the 4Nec2 software. Fig.2. Antenna modeled with 4Nec2. The antenna has an impedance of about 300 ohms at the feeding point, almost in all the 3-30 MHz band. It can be used with a 50 ohms coaxial line with a 4:1 balun. In this sections the results of the simulations with 4Nec2 are shown: calculated standing wave ratios (SWR) and radiation patterns. SWR calculations for a characteristic impedance of 300 ohms. In some cases, particularly if the antenna is placed near metallic objects, it is recommended to use an antenna tuner. The fig.3 shows the results of the simulation for all the 3-30 MHz band, considering a characteristic impedance of 300 ohms. Fig.3. SWR (300 ohms) in the 3-30 MHz band. 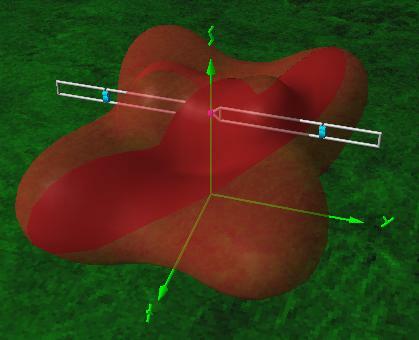 80 m band: bidirectional antenna (fig.4) with main lobes perpendicular to the antenna's axis, and losses around 0.76 dBi. The antenna also radiates in NVIS mode, presenting a loss of 0.76 dBi. Fig.4. Radiation pattern at the 80 meters band (3.5 MHz). 40 m band: bidirectional antenna (fig.5) with main lobes perpendicular to the antenna's axis, and gain around 0.57 dBi. The antenna also radiates in NVIS mode, presenting a loss of 0.78 dBi. Fig.5. Radiation pattern at the 40 meters band (7 MHz). 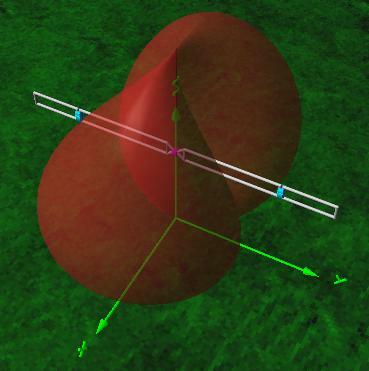 20 m band: bidirectional antenna presenting four main lobes at 30 degrees from the perpendicular to the antenna's axis (fig.6). Gain around 3.26 dBi. Fig.6. Radiation pattern at the 20 meters band (14 MHz). 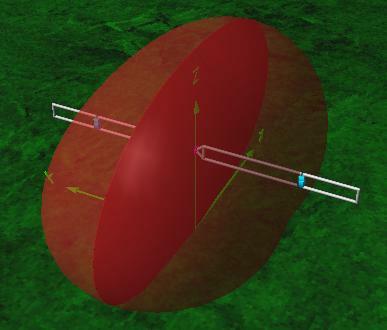 17 m band: bidirectional antenna presenting four main lobes at 55 degrees from the perpendicular to the antenna's axis (gain 8.24 dBi) and two secondary lobes perpendicular to the antenna's axis (gain 4.43 dBi). See fig.7. Fig.7. Radiation pattern at the 17 meters band (18 MHz). (c) 2008-2019 - Ismael Pellejero Ibáñez - EA4FSI - 28T1 || Contact form || Site map || Page last updated: 14/03/2012.